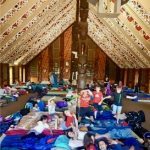 On Tuesday morning, our Whānau Mārama students from years 4 & 5 boarded their buses for Orākei Marae. What followed was 2 fabulous days of friendship, learning and eating (so much eating!) in the most beautiful setting, high above the sparkling waters of the Waitematā, overlooking our lovely islands. 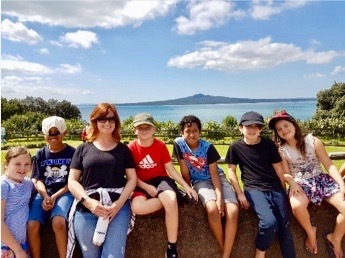 Cruise ships, ferries and pirate boats glided past us, pepeha were recited, kapa haka performed and expeditions to significant places of interest were carried out – 2 memorials, 1 cemetery, a beach, a trig station and a fantastic playground. A crew of dedicated parents cooked, washed our dishes and cleaned up after us. We owe them all a huge debt of thanks. Everyone felt very blessed by such kindness and a good time was had by all.